It was super hot out today and my son came inside and asked for ice cream. 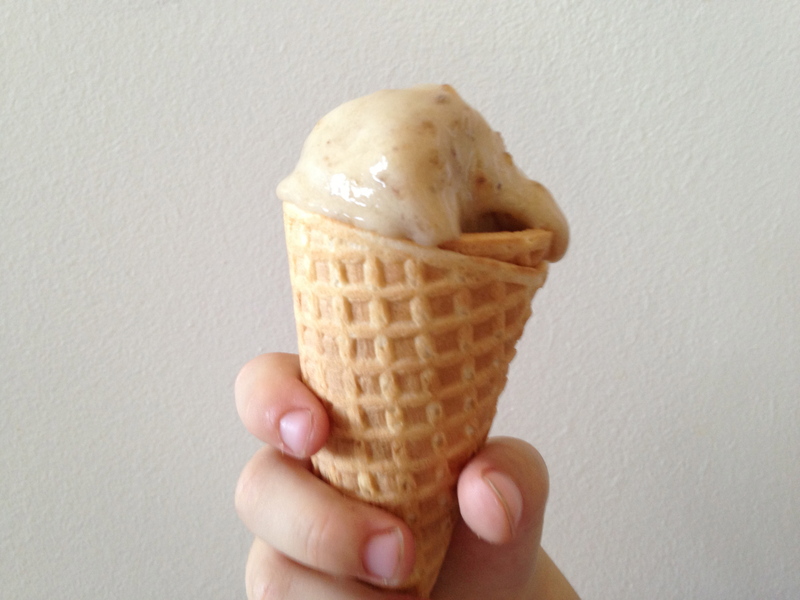 I haven’t made any ice cream shmice cream yet this summer so I made the very vegan standby: banana ice cream made from frozen bananas. If you read this blog, you know I drink a shake-y shake every morning and I keep tons of frozen bananas in the freezer. Just put them into the food processor and voila, instant ice cream! You don’t even have to add anything to it. It’s perfect the way it is. Place the frozen bananas into the food processer. Process until completely crumbly. Turn them out into a bowl and mix well and it will come together like soft serve. I found these organic, vegan ice cream cones at the health food store and I keep them around just for this kind of occasion. Delicious!